Dozens of people gathered Oct. 1 on College of Southern Nevada’s Charleston campus as they bowed their heads for a moment of silence as lit candles brightened the night sky to commemorate those fallen in last year’s shooting. 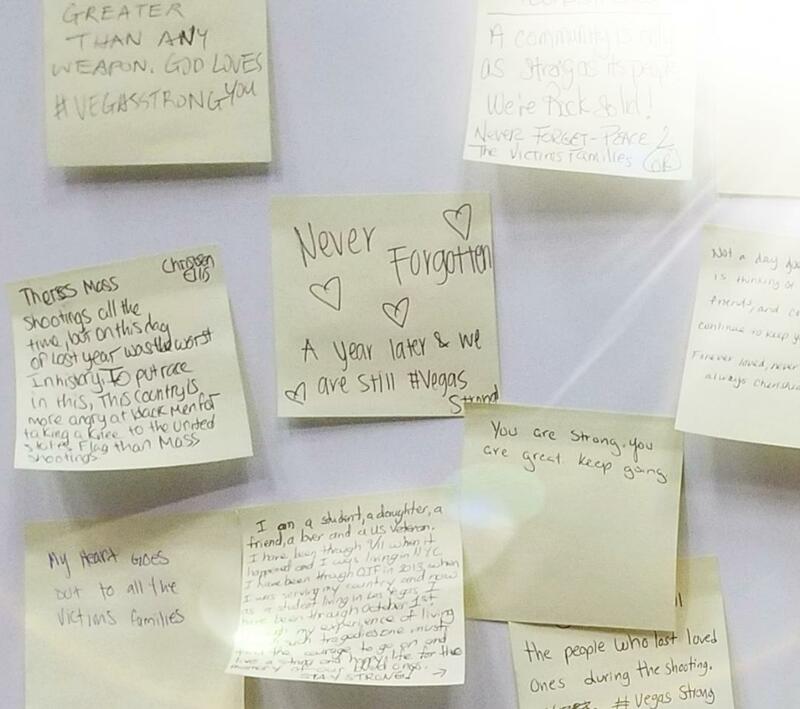 Students, faculty and the community united on the anniversary of the most tragic moment in Las Vegas history when an active shooter took the lives of 58 people at the Route 91 Harvest Festival. They showed support for all those affected and those who were involved. 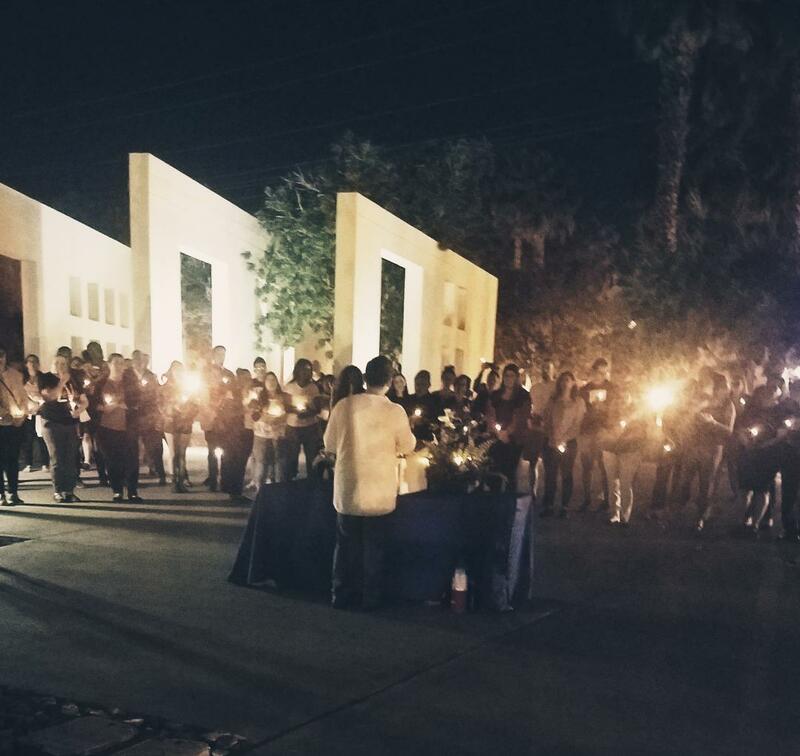 In honoring the souls lost, approximately 50 people stood in Palm Tree Circle on campus at the vigil while many took to the stage including CSN administration and faculty to share their experiences. It was an emotional night. As part of CSN’s student government ASCSN Senator Jacob Narvaez helped plan the night. He shared, “I wasn’t at the [shooting last year] but three friends were. One of my friends broke her leg after falling and being stepped on. My other friend Erick died as he was trying to help people. He had a bright future ahead of him. He was young.” Narvaez’s personal losses weighed heavy on his heart as he teared up at the vigil. Part-time Paramedic and CSN public safety and emergency management Instructor Scott Lloyd shared his heart wrenching accounts of that unforgettable night. He was a first responder last year. “We left the safety of our homes to care for our community.” He was called in the middle of the night and quickly got dressed to head to the scene. He told his wife there was a shooting and he had to go. She was hesitant for him to leave but he had to. He will never forget the details of that night. Before concluding the evening CSN communication Professor and speaker Charlene S. Gibson shared this empowering message. “Remember that there is always an Oct. 2 when we come together. We are a strong, united community.” Oct. 1, 2017 was difficult for Las Vegas and CSN community but on Oct. 2 the whole city was Vegas Strong. “If we can move forward and live our best lives than those 58 lives were not lost in vain,” Gibson added.